THE ASSIGNMENT: You will be interviewing and introducing a member of the class. YOU ask the questions AND write the answers! Please do NOT hand the paper to your partner and have them write answers. Here is a link to some possible questions. Here is another link to page with some great questions. You can also ask questions like I asked you for the Personal Histories assignment. You may also use the document in Google Classroom to enter your answers using your Chromebook. CONTENT: You can use all or any combination the questions provided or make up your own. All questions and answers must be appropriate for the classroom. Make sure you get explanations and ask those “Why?” questions. This should NOT just be a list of facts; tell a story about your partner. Try to have at least two sentences about each of the things you share. ORGANIZATION: Use an answer to create a “catchy” beginning and ending statement to get our attention and then end the speech. Try taking an interesting fact or interesting talent about your partner and then tie them together. Beginning – “Have you ever met someone who has an odd fear of ventriloquist dummies? Well today I’m here to tell you about Mr. Keller who has this very fear! Also arrange your presentation in a logical way- don’t just follow the list of questions! If you’re talking about the school activities but also want to mention their favorite class, link those two things together. DELIVERY: You will get two notecards to use during your presentation. Try to avoid reading straight off of the cards and instead actually talk to the class as if we were having a conversation. This is the first speech and most of us will be nervous! Keep that in mind and remember we only know you’re nervous if you show or tell us! The more your PRACTICE the better prepared and comfortable you will be. TIME LIMIT: Your presentation should be 2- 2 ½ minutes. 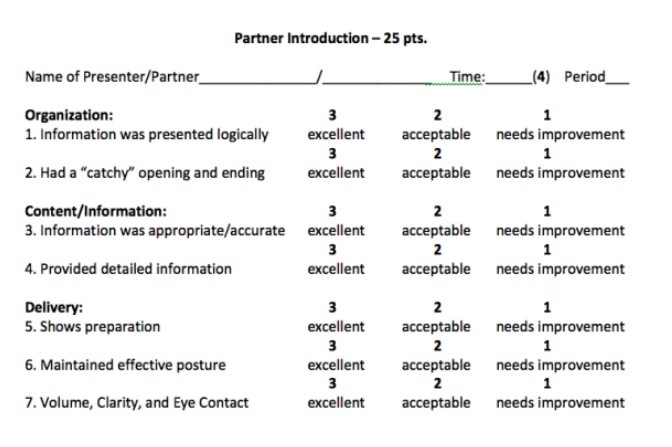 SPEECH EVALUATION – Click here to see the Grading Rubric. Organization: Information should be presented logically and have a catchy opening and ending statement. Content: Information must be appropriate and accurate, have enough information to meet time requirement, and not just be a list but rather a description. Time limit: Presentation must be within the time limit. Here are some sample questions to get you started.